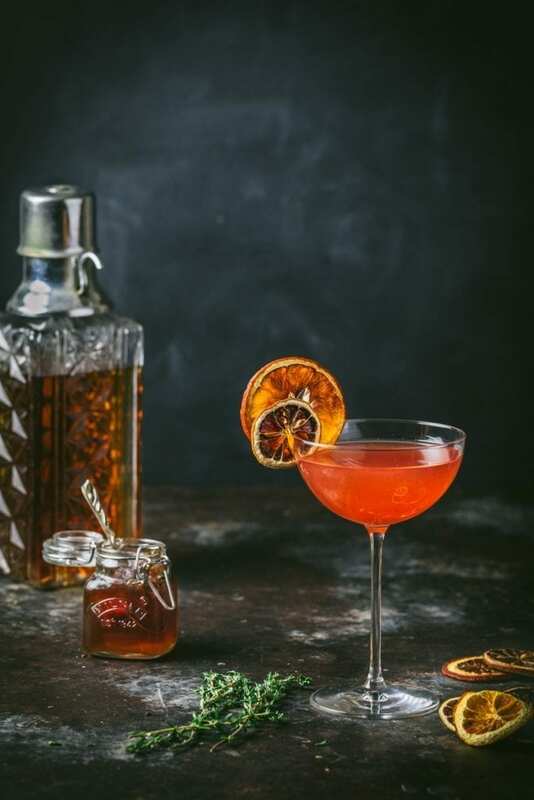 A beautiful, balanced and sophisticated cocktail that pairs rye whiskey, Campari and sweet fig jam. Fresh lemon juice and lemon bitters add a bright, citrusy note. This is what we’re drinking on Valentine’s Day… and as often as we can after that. We’ve officially been seriously flipping busy lately. Besides our day jobs — did we mention we have day jobs? sadly this blogging lark doesn’t keep us in dog treats, cat ointment or chicken vests — we’ve been working extremely hard on a super secret Nerds with Knives-related project that we’ll tell you about in detail in a couple of months. The defining element in the cocktail is fig, which in this case is supplied by fig jam. While fresh figs are only in season for a very short time, you can pick up good fig jam at just about any grocery store any time of year. Besides the flavor, the jam adds a mellow sweetness that balances out the sharp rye. If fig isn’t your thing, plum would be another nice option. We decided to use our favorite local Hudson Valley rye because we love its spicy and peppery notes, but any decent bourbon would also work well. As always, a mixed drink isn’t the place to use your fanciest, most expensive whisky, but there are quite a few good, decently-priced ryes these days. Our other go-tos are Rittenhouse Rye, Redemption Rye and Bulleit Rye. 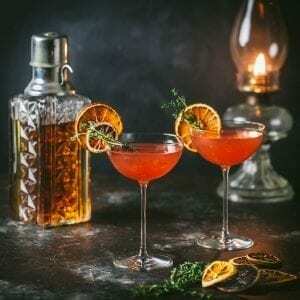 To balance out the sweetness, we turn to the Italian aperitif, Campari. 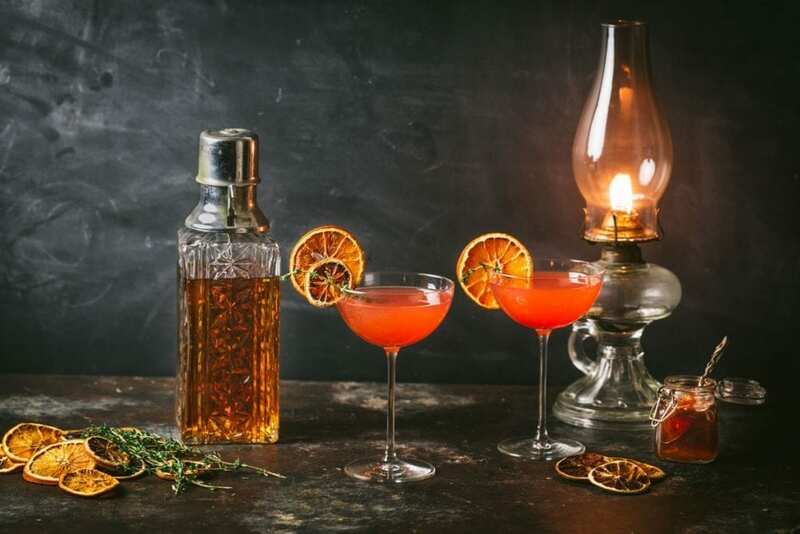 The key component in Negronis, Campari has an herbal, bitter flavor that, once you get a taste for, you want it in everything. It also adds an incredible deep pink color, which makes it perfect for a Valentine’s Day cocktail. 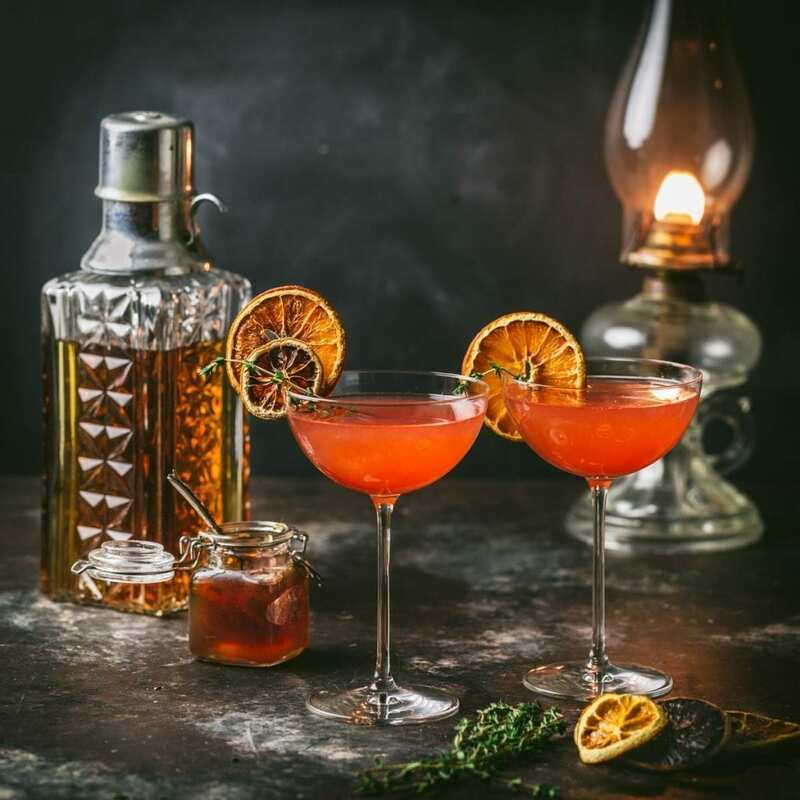 To serve, we topped the glasses with dehydrated slices of lemon and blood orange, and threw in a spring or two of thyme for a little herbal note. Happy Valentine’s Day! 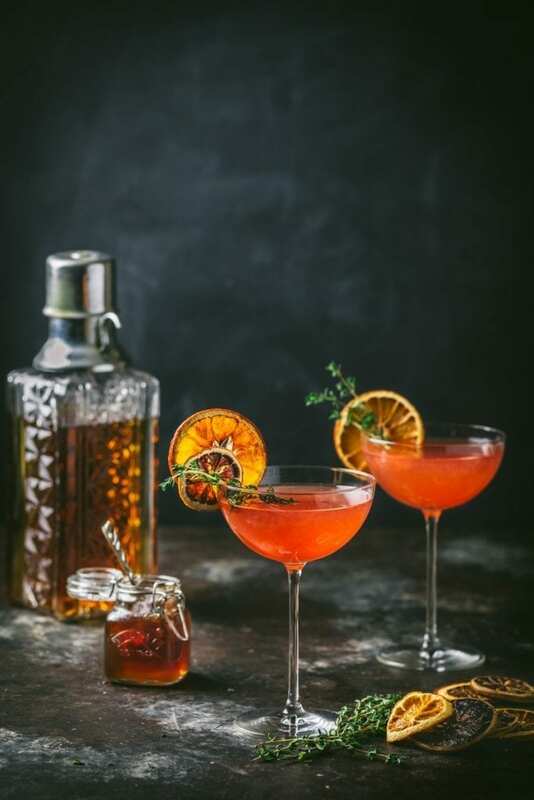 In a shaker filled with ice, add rye, Campari, fig preserves, lemon juice and bitters. Shake vigorously for about a minute. Double strain into a cocktail glass and garnish with a slice of lemon and a sprig of thyme. Excellent cocktail! It has body and derp flavor.